You’d think such a small word wouldn’t have such huge implications. It ought to be insignificant. How much difference could it make – really? Yes, I’m referring to that thing we quilters call a scant 1/4″ seam allowance. It’s elusive. It’s cursed… much-sought-after… and occasionally incomprehensible. Does it really matter? I wish I could give you a definitive answer but there are times when no, it doesn’t. When I’m piecing half-triangle squares that will be trimmed to size, my seam allowance isn’t an issue and having a slightly smaller seam allowance means I’ve got a little more skoosh room with trimming. 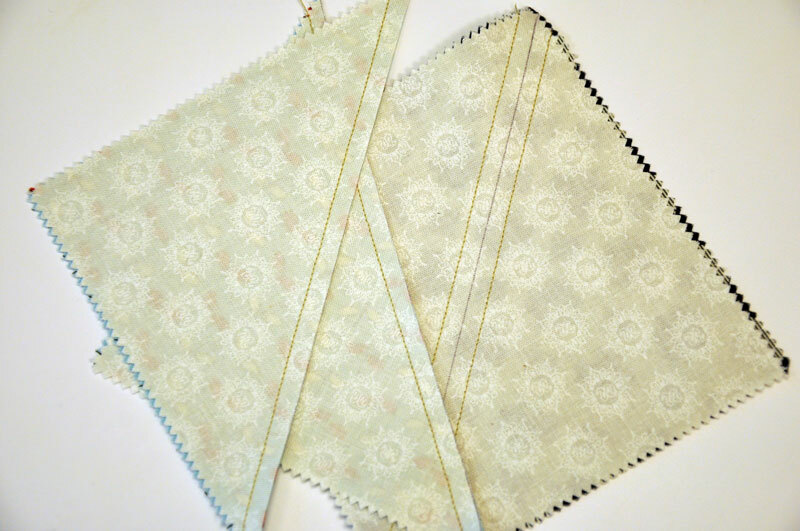 The reason we use a 1/4″ seam allowance is simple – it’s easier than using a 3/8″ seam allowance, or the 5/8″ seam allowance some of us learned to use with garment sewing. If you learned “professional” or “production” sewing techniques, you learned a 1/2″ seam allowance. With garments, a sleeve was eased into the armhole, the measurement didn’t have to be exact. Unless it was supposed to be… we’ll leave that discussion for another day, okay? 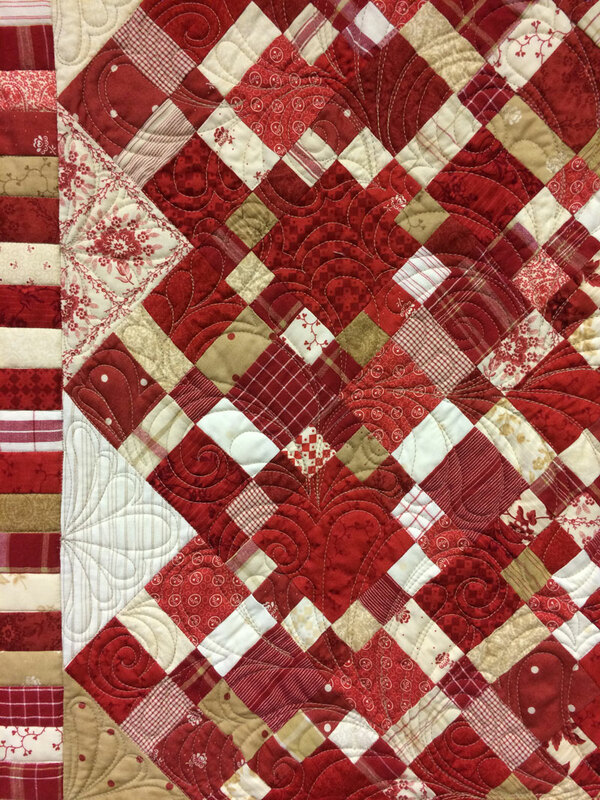 With quilting, we needed to be able to fit pieces together with precision. And since most pieced quilt designs are based on geometric shapes, it naturally follows that it’s a math-thing. Having a single, consistent seam allowance made drafting pieces easier, and it made cutting easier after rotary cutters were invented. But how and why did a 1/4″ seam allowance become a scant seam allowance? Because of thread, the space a line of stitching takes up, the thickness of fabric, the fold when it’s pressed and so on – it would be too easy if it were just one single reason why. All of these things factor into the final measurement of your pieced unit. But I’ll get to that in a moment. I’ll bet your sewing machine has a 1/4″ foot, it might even be called a “quilter’s 1/4″ foot”. Your machine might also have a marking on the plate for a 1/4″ seam allowance. There’s just one teeny, tiny problem – it’s probably not accurate. Have you checked it? This is my Bernina Activa 240 with the quilter’s 1/4″ seam allowance. Do you see the little vertical mark in front of the feed dog on the right side? That’s the mark on the plate for the 1/4″ seam allowance. 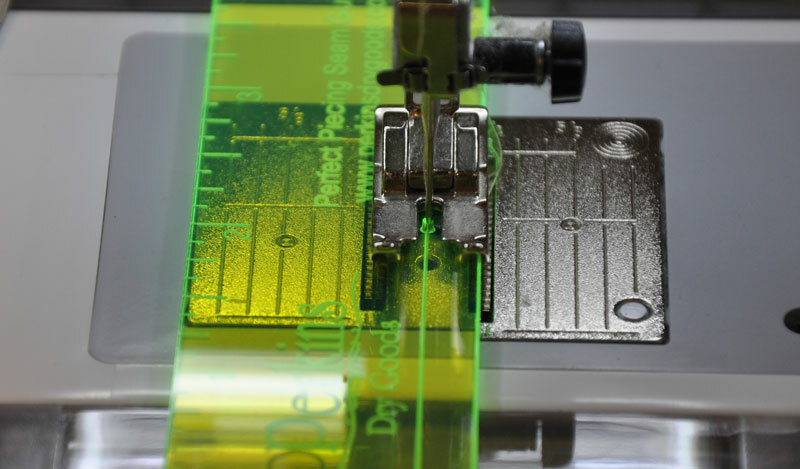 The yellow ruler is the Perfect Piecing Seam Guide from Perkins Dry Goods – it’s the best way I know to find where your perfect scant 1/4″ seam line should be. As you can see, Celine got it right. Bernina didn’t. They’re a true 1/4″, meaning that my piecing would come up just a little short of perfect. I’ve used these guides for years and I still find them to be the best, fastest way to find where the perfect scant 1/4″ should be on any machine. The needle is put through the hole in the guide and then the edge of the ruler can be used to mark your machine with masking tape, moleskin or some other marking tool like Q-Tools Sewing Edge. 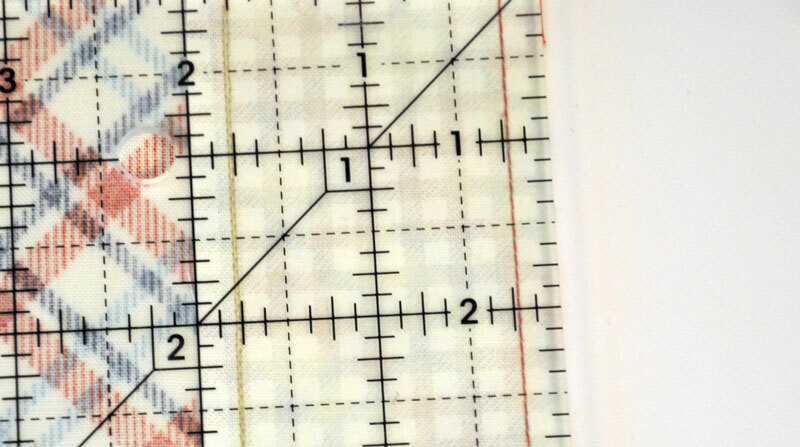 To test your machine or markings, the best way is to cut some strips and sew them together. 1 1/2″, 2″ or 2 1/2″, it doesn’t matter, just cut more than two strips. Two is easy, three or four is where you can start seeing just how accurate you are. When I’m asked whether or not we should fret and obsess about achieving the perfect scant 1/4″ seam allowance, my answer is “maybe”. Meaning, while a good scant 1/4″ seam is essential to truly accurate piecing, it isn’t the only thing to factor in. First, both layers of fabric being stitched must be accurately cut, and then they have to be matched up evenly. Then the lines of stitching have to be straight and even – consistently, start to finish. If you do all of those things and you’re a thin thread’s width away from “perfect”, only you can decide if it’s worth worrying about getting it more perfect. I describe myself this way – I pay attention to it, but I don’t measure every piece at every step of the way. In 30-something years of quilting and working at it, I’m still one very thin thread’s width away most of the time. I’ve learned how and why to make it work, and I know when I have to pull out the seam-guide, mark my machine and really work to get it right. So if I want to make the sampler quilt on the cover of Lori Holt’s Farm Girl Vintage book – and I love that quilt – then an accurate seam allowance matters. This quilt is another good example. 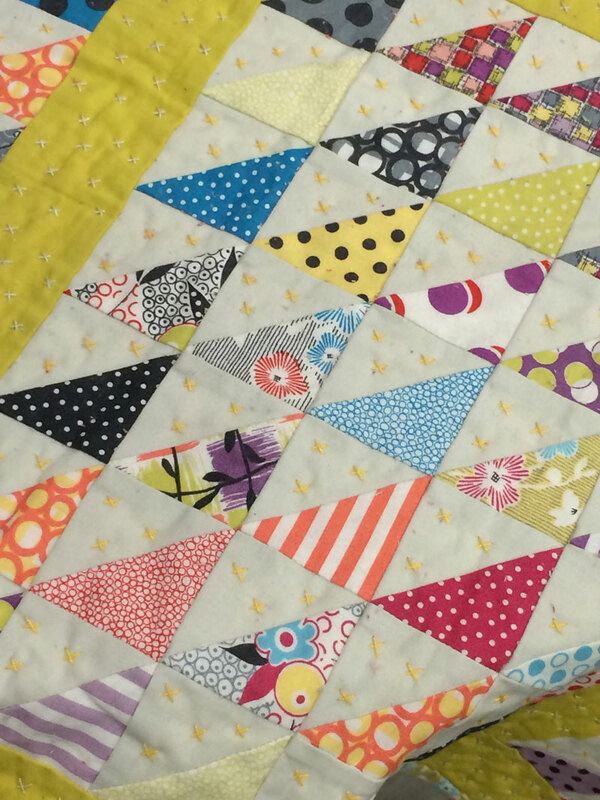 I love this quilt – it’s Jen Kingwell’s but I’m blatantly, shamelessly copying it. This quilt top has two reasons why accuracy is important, the most obvious being not wanting to chop off the points of those half-triangle squares. Then there’s the block – it’s a 49-patch block, seven rows of seven squares. Seven times 1/32″ is almost a 1/4″ difference in the size of the block. I easily can cut my sashing strips smaller but what if the pieced block were being joined to another pieced block, something that can’t easily be re-sized? That’s when you start having problems – problems that can be easily avoided with an accurate scant 1/4″ seam allowance. So I keep an eye on my seam allowance with measuring. There are two things that need to be measured – the seam and seam allowance, and the size of the “finished” piece. For measuring the seam itself, I love the three Omnigrid rulers at the top – the Marking Ruler Trio. They’re easy to keep by the machine for a quick test – and they’re terrific for adding a 1/4″ seam allowance or drawing a line across a square for half-triangle squares, connector corners, etc. And the Perfect Piecing Seam Guide. The finished piece also has to be measured regularly and for that, I like any square ruler – small for small pieced units, bigger for bigger pieced units. 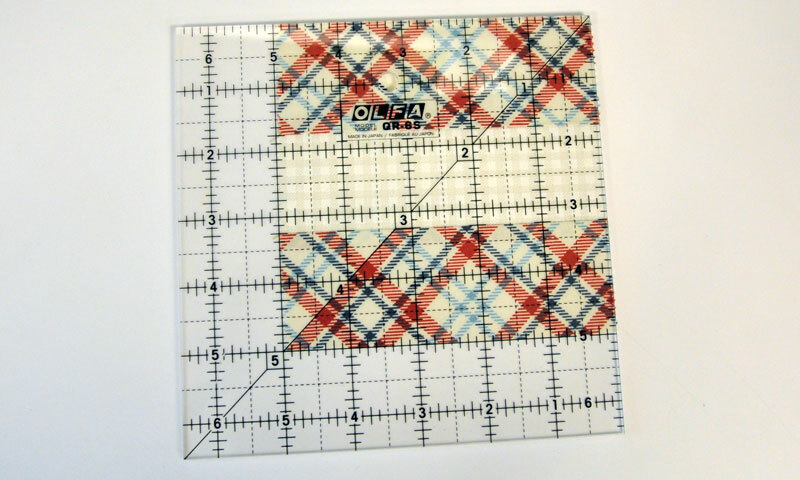 My most favorite ruler is a 4 1/2″ x 4 1/2″ ruler because it’s easy to keep by the machine and it’s easy to handle, especially when I’m doing smaller piecing. And yes, I love the Olfa Frosted Rulers. Thread. If you’re piecing with a fine 50 wt. like Aurifil or a 60 wt. thread like Presencia, the line of stitching takes up less room than a thicker 50 wt. thread. This doesn’t mean you need finer thread, it just means you need to factor this into where your stitching line is for a perfectly-pieced finished block. Pressing. Pressing seams open means there is less “roll” in the fold. Fabric. Flannel is thicker than a Bella Solid, and batiks and lawns are often more flat because of their higher thread count. That will affect how they press, thereby factoring into the size of the finished piece. Do you see why I pay attention to seam allowance but don’t obsess about it? Worrying about all these things can take all the fun out of sitting down and making something pretty! Unless you’re the kind of personality that enjoys the process of making something perfect or you’d like to someday enter a quilt in Paducah or Houston. Then you’re probably already paying attention to these things. But I’m not going to worry about them today. It’s Friday and I’m hoping to sew this weekend. I also have to pack for the retreat, I leave for that on Tuesday. If you’ve never been to a quilt retreat, you should absolutely try to go. It’s a lot of fun. I’ll be “here” next week with a few more tips for our Tip Jar. In the meantime, I’m sewing, finishing new patterns and trying to stay out of trouble. Though really, with Market looming, I don’t have time for much beyond work, Market-sewing, eating and sleep. And showers. I hope you have a terrific weekend, and I hope you get to sew. That’s what I’m planning… though after all this discussion about seam allowance, I think I’m in the mood for a little improv piecing. “Kerf” – the width of the saw blade. When I started quilting I was working at a company that forged metal for the aerospace industry. It was precision cut to meet exact specifications +/- .010″. When figuring the cut, we had to allow for the kerf, the width of the saw blade. I was a new quilter but I realized that I had to allow for the thread/pressing kerf when piecing. The only way to do that with fabric was to “scant.” I don’t always scant now but my piecing is much more perfect when I do. Oh, at first I tried to just move the needle one click over but I usually didn’t remember to do that when I sat down to sew the next day. So sewing scant with the default needle placement setting works best for me. Great post! Thanks for the reminder to just do it! Great post, and as a visual learner I appreciate all the pictures you included. Now I know where to send the new quilter I’ve been working with, she needs to see this! Wow! This came at the perfect time! I have 2 Chevron quilts in the works, and this is going to help tremendously. (think I will need to redo a few of the squares!). Thank you so much Carrie, for this enlightening description of a “scant”. Am definitely going to purchase a Perfect Piecing Seam Guide. Always look forward to your blogs! I’ve said it before, and I’ll say it again – I’m SO glad you’ ve come to Moda and started writing in this blog. It’s fun to read and this one especially is so full of useful information. Thanks, Carrie. Totally agree with Barbara’s comment about your arrival. I used to check this blog occasionally … since you’ve come on board it’s a daily routine for me to check it and am always pleased to see a post by you! Thanks sew much for that most informative post. Have a great weekend. Spot on Carrie! I was using my 37 foot on my Bernina as a guide , until I got my 550 which got it wrong also! so now I measure and move the needle position to a scant 1/4 , makes piecing much easier in the long run, and of course cuts down on my bonding time with the seam ripper, LOL Have a great weekend and have fun at your retreat! I am just waiting until my next one, which isn’t soon enough by the way . Toodles! Terrific post today, Carrie. I pieced a 60″ wide quilt with my 1/4″ foot and sewed carefully. It ended up at 60.5″. I hope that my piano key border will fit the top. I do have the Perkins Dry Goods ruler, so I don’t know why I didn’t bother to check the accuracy of my foot. I will now!! Thanks and have a great sewing weekend. Best explanation of scant 1/4″! This post is the best explanation of a scant 1/4″ seam allowance I have ever read. Thank you Carrie. I for one will he adding some notions to my supply list. Wishing you a great weekend and a spectacular retreat. Looking forward to seeing you at Spring Market. Great post, I worry about my seams and this will help me be more accurate (and also stress less about it). Great lesson! Thanks! I too love the Perkins Scant 1/4″ Ruler. I hate that I have to convert all seams to metric. Eventually I’ll get used to using inches. I wish there was metric quilting rulers. I’m still a beginner. I’ll get there eventually. 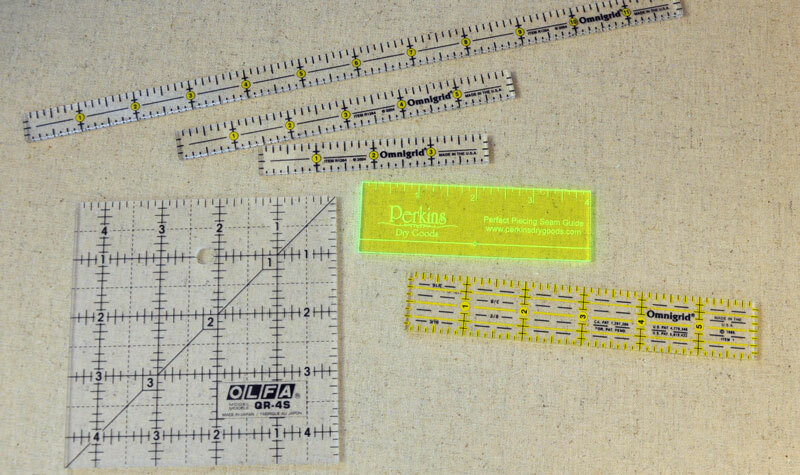 where do you purchase the perkins ruler? Agree with Nancy. When you write blog posts about these tools and notions, it would be helpful to let us know where to find them! Great blog post. Best one I have read on the topic in the last couple of months. I have the Perkins ruler. Bought it when I when I took my first beginning quilt class at my local quilt shop as a part of the suggested supplies. I had no idea what it was for until we went through the exercise finding the 1/4 inch on my machine, making and measuring a 9 patch block for accuracy. I upgraded my machine because I could not position my needle. Was not a fan of tape, post-it, or any other stick on guides. I keep the Perkins ruler in my sewing box so that if I I’m using a borrowed machine at a retreat , class, or seminar my project will be pretty accurate when I get home.